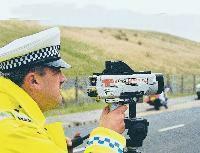 The Government has said no to a petition signed by 3,539 bikers demanding all speeding fines levied against motorcyclists be frozen. The call was made for the fines to be suspended until the Home Office tests speed detection equipment on bikes. An official response to MCN’s petition said there were no grounds for freezing fines despite admitting the Home Office does not test speed cameras on bikes. It repeated a previous claim that police conduct roadside tests on all passing vehicles including bikes.